Haddad Brothers, christening and communion, childrenswear for special occasions - products - Haddad Brothers, Inc.
Haddad Brothers welcomes you to make your selection of christening, baptism, bris / brith milah apparel, accessories and PRIVATE LABEL, as "America's Leader from coast to coast in Christening"TM, outfits and matching accessories; we offer the widest selection of styles and accessories. 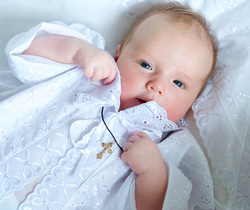 The sizes range from preemie up to toddler, in Christening. The sizes range from 6 to 18 1/2 in Dresses. Our selection is accessible to everybody due to our wide range of different styles and of price categories; from Boutiques to Major Department Stores, to Major Online Retailers, Chain Stores, and more. The Consumer Product Safety Improvement Act (CPSIA) requires all manufacturers, importers, and retailers to comply with the US Government mandated guidelines for all children's products, among others. Haddad Brothers is in full compliance with the CPSIA. Our entire line has been tested by Government accredited CPSIA laboratories. Our suppliers are compliant as well. The certificates have been made available to our retailers. Haddad Brothers is on a regular update service with the CPSC, monitoring any changes to laws and new rules, in order to continue to comply with our products.